and “3600” is the number of seconds in an hour. If you don’t have a power meter or GPS/accelerometer but would like to use WKO+ to manage your training you can estimate your TSS and input it manually into the software. Many triathletes already do this with their swimming since as of this post there is no downloadable device that can be used to determine swim TSS (I expect to see that change in the next year). And there are also times when the device fails because the battery goes dead or you inadvertently erase the data and so being able to estimate the TSS salvages a data point. To estimate TSS you must know two things: How long was the workout, and how intense was the workout. How long is easy. You just need a stopwatch. How intense is the hard piece. This is where estimation comes in if you don’t have a power or pace device. To estimate intensity for a workout you need either a subjective Rating of Perceived Exertion (RPE) or average heart rate. Both of these are far from perfect, but they can give you a TSS estimation which is close. And given that you will use the same method each time you should be relatively accurate (or inaccurate as the case may be). 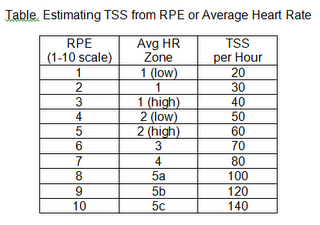 Example 1: A 30-minute workout at an average RPE of 6 would be a TSS estimate of 35 (70 x 0.5). Example 2: A steady 90-minute workout at an average heart rate of high 2 zone would be a TSS estimate of 90 (60 x 1.5). Example 3: A 15-minute warm-up averaging high heart rate zone 1 (TSS 10) followed by 30 minutes at heart rate zone 5a (TSS 50) and a 15-minute cool down at low heart rate zone 1 (TSS 5) would produce a one-hour workout TSS of 65 (10+50+5). And one caveat: Since FTP is by definition 100 TSS for one hour, a 100 TSS workout cannot last longer than one hour. A portion of the workout can be one hour with a TSS of 100, but an entire workout that lasts longer than an hour cannot be at the 100 per hour rate. Once you have an estimated TSS, plug this number into your WKO+ software on the Calendar page. To do this right click on the appropriate workout date, select “Create a New Workout”, click “Save”, and then right click the new workout selecting “Override values” from the pop-up menu. Type in the estimated TSS and you’re done. Easy, huh? Actually, it gets quite easy as you become accustomed to it.